Leaving her native Sweden behind, Big Hanna arrives at McGill where, under the watchful eyes of administrators and curious onlookers, she saves the day by living up to her name and consuming up to 1,200 kilos of food per week. Sound like the bizarre plot to a yet-to-be-released Coen brothers’ movie? Well it isn’t. No star of the silver screen, Big Hanna T240 is a stainless steel industrial composter that proponents hope will change the way McGillians think about table scraps. Decomposing foodstuffs never sounded so exciting. And why shouldn’t it? 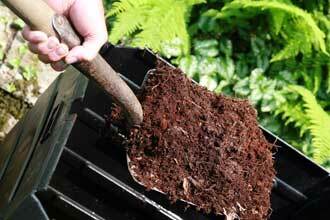 Composting converts a large portion of your food waste into healthy soil. This by-product of natural recycling will help your garden grow instead of emitting greenhouse gases and taking up landfill space. Environment Canada tells us food wastes are the very materials that, once in the landfills, produce ozone-damaging methane, a greenhouse gas that is 21 times more potent than carbon dioxide, another global-warming threat. The David Suzuki Foundation estimates that methane emissions from landfills account for 2.9 per cent of Canada’s total greenhouse gas emissions. That figure is expected to grow in the year 2010. When organic material is exposed to water in landfills, the liquid runs down through the pile, picking up contaminants along the way. Groundwater contamination by leachate can be a problem with landfills. Gray-Donald joined Gorilla Composting in 2007, at the tail end of a campus composting pilot project in which they collected food waste from various locations at McGill and had it hauled off to Quinn Farm in Île-Perrot. Since then, he and his colleagues have been trying to nudge – and sometimes cajole – the administration into taking the composting baton and running with it. “There were a few operating problems with the pilot project that turned some people off,” said Gray-Donald. That combined with higher-than-foreseen transportation costs stood as obstacles to any new initiatives. But the shared belief that McGill had a social responsibility to reduce its significant waste stream and set an example for the community brought various groups to the table, including the Office of Sustainability, Food and Dining Services, Gorilla Composting, and Buildings, Grounds and Special Events. Lessons learned from the 2007 pilot project, as well as from other local composting operations, were applied during the process to select the proper institutional system. The decision was made to go with the Big Hanna composter manufactured in Sweden because it is proven technology in the urban setting and very compatible with McGill operations. Since this is the only Big Hanna in Montreal, the installation will also provide a valuable learning opportunity for other neighbouring institutions who are interested in composting their food waste.